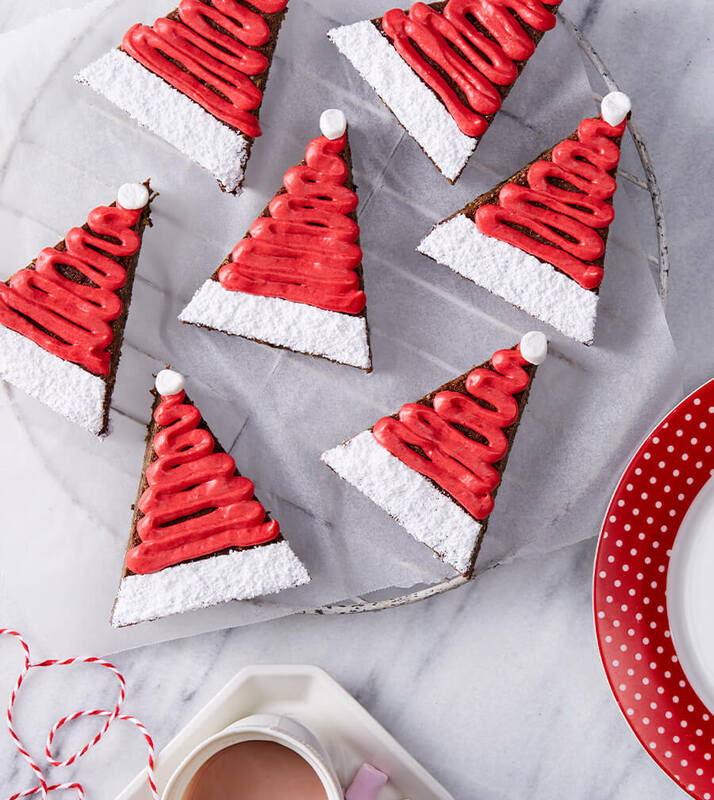 These cute, festive brownies make a delicious addition to any Christmas celebration! Place zucchini in a colander while you are getting other ingredients ready. Preheat oven to 190°C and line a round cake tin with baking paper. In a large bowl, add egg, oil, maple syrup or honey and vanilla extract and whisk to combine. Add cacao powder, baking soda and salt and whisk until well mixed. Give zucchini a gentle squeeze to remove excess moisture but do not ring out completely. Add to bowl and stir. Add flour and mix gently until combined. Transfer batter into prepared cake tin and level with spatula. Bake for 25-30 minutes. Remove from the oven and let cool for about an hour. Lift by the parchment paper flaps and transfer to a cooling rack to cool off completely. Cut into 8 wedges. Beat cream cheese, butter and honey or maple syrup together in a bowl until light and fluffy. Add the food colouring to the remaining icing and stir to combine. Spoon icing into a piping bag (or into a ziplock bag and then snip off the corner). To decorate each brownie, use a piece of piece of baking paper with a straight edge to cover the brownie, leaving a strip at the bottom. Use a sieve or tea-strainer to sprinkle icing sugar over the exposed edge. Zigzag the red icing over the remaining brownie. Place half a mini white marshmallow at the pointed end of the brownie.